Triangles $DEF$ and $A'B'C'$ are similar. 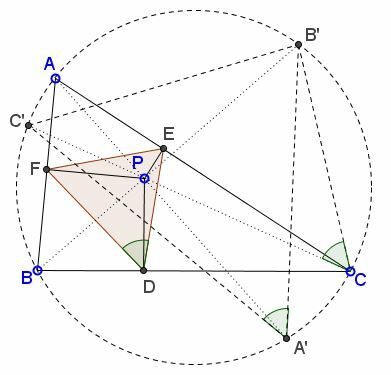 Triangle $A'B'C'$ is known as the circumcevain triangle of point $P,$ and the property at hand has been established elsewhere by elegant and characteristic of the situation angle chasing. Below, I use another form of angle chasing with a reference to a different page.